The sky glows with soft pinkish colors of fading twilight in this serendipitous mountaintop vista. Taken in subfreezing temperatures, the thoughtfully composed photo shows snowy, rugged peaks seen from a mountain pass on November 14. Below lies the village of La Villa, Alta Badia in Italy’s Dolomite Alps. Above the nestled village lights, the constellation Ursa Major hangs over the northern horizon. 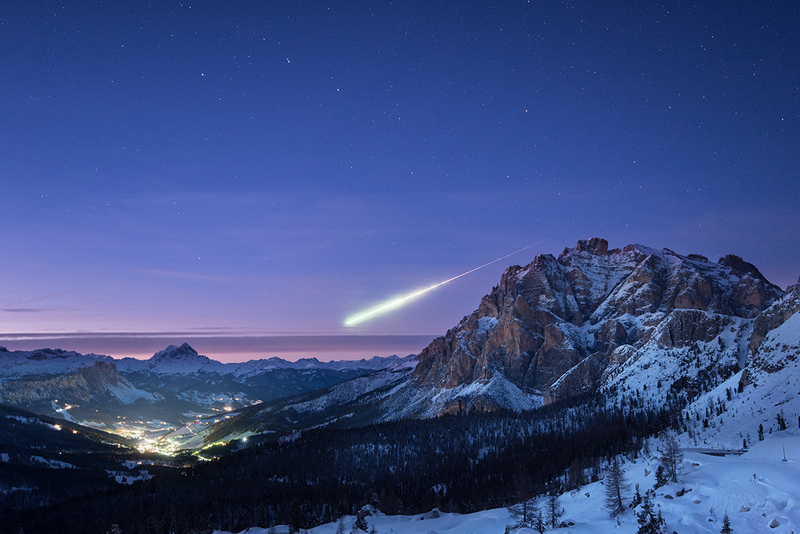 But most stunning is the intense fireball meteor. It was captured during the camera’s exposure by chance as it flashed east to west across the northern horizon, under Ursa Major’s familiar Big Dipper asterism.